This is a film about seven artists. It’s also a film about seven people who are mentally handicapped. In the course of this touching film, we discover how art may provide a route to the human interior. Sato zeros in on the creative genius of people whom we usually relegate to the social margins for their “non-productivity.” Shot over an eight-month period after extensive research, the film strings together many subtle, special moments. 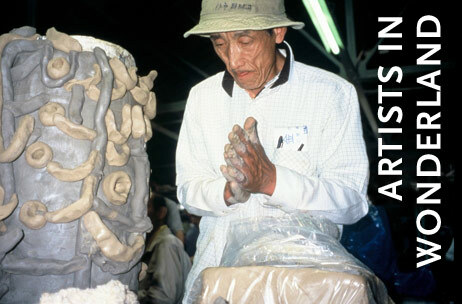 The director of photography is Seizo Tashima, a painter who has long collaborated with handicapped artists. Any film on art needs such understated, yet brilliant, photography in order to defer to the talent of the subjects. The camera peers at them at work, following their creative processes step by step, listening to their thoughts about their art and about art. The intensity with which they draw, paint, sculpt (and film!) is relieved by sequences that display the work in all its brilliance. The montages of line, color, and form are concrete expressions of these artists’ fears, joys, obsessions, and every other familiar human emotion. Artists in Wonderland has all the marks of a Makoto Sato film: the quirky humor and passion for the human everyday.